Who can plumb the cormorant’s mind? Two perched cormorants croak at a third as it flies past. Were they warning it to stay away? Were they welcoming it? Who knows? 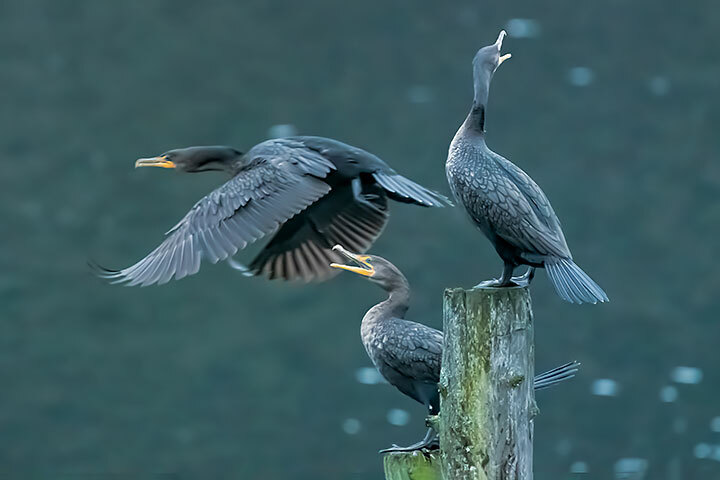 Two Double-crested Cormorants react to a third’s flyby with croaks. That’s a beautiful composition of cormorants. Well done. I think they were calling out – looking good! Such a capture of that trio…thanks! Hey folks, Joe’s flyin’ by again — third time today! Thanks folks. I really enjoyed the fine picture and all the comments.